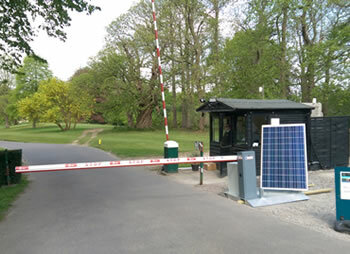 The security team at Leeds Castle near Maidstone, Kent had a problem recently when their 15-year old security barrier at the main trade entrance failed. With an urgent need to secure the castle premises day and night, something had to be done - that day. A new three phase entry barrier was ordered but this was going to take up to a week to be delivered and installed. Faced with escalating 24-hour manned security costs, security manager Kelvin Wood, turned to the SOSEC team. Within two hours, castle security was back in place and a SOSEC Solo barrier was delivered, operating on solar power alone. The SOSEC barrier arrived on site pre-built and ready to go to work with minimal final assembly. It was placed a few metres from the old barrier and connected to the existing access control. This allowed the security team to use the SOSEC barrier in the normal fashion during the day to manage traffic in and out of the castle grounds. At night time, residents and staff were also able to access the ground in the usual way via intercom or proximity tags. Running entirely from solar power, there was no need to run a mains power supply over to the temporary barrier which would have caused a possible trip and power hazard. Solar power and power storage is the unique element of the SOSEC system. The high-capacity solar panel allows the barrier to operate up to 900 times per day - even in a British winter. The SOSEC Solo barrier was delivered with its standard 5m boom with contact reverse and soft bump strip under the boom, ensuring it is safe for pedestrians and meets the BS/EN 13245 standards. The concept, developed by Kent-based Green Gate Access Systems is designed around the growing need to provide temporary security to sites where power provision is not practical, but security demands are high. As staffing and security costs rise, SOSEC offers a security solution with no further running costs, saving physical security costs and the environment. It has never been more important to ensure that every practical effort is made to keep members of the public and staff safe in and around active work sites. SOSEC solar mobile barriers tackle these demands simply, thoroughly and harness the power of the sun.